[ Count Dmitry Guriev, Russian Minister of Finance ] Autograph Signature in Cyrillic script. The item consists of a valediction and signature in Cyrillic script, at the head of a 13 x 20 cm piece of paper, with cropped corners, cut from the end of a letter, and mounted on part of leaf from album. In fair condition, lightly-aged, and with slight staining from glue used in mounting. Laid down beneath and to the left of the signature is a 10 x 8.5 cm piece of paper on which is written, in a nineteenth-century hand: 'Letter of introduction from the Russian Minister of Finance Count Gourief to his Son General Gourief Governor of Odessa'. [ Nathan Rothschild, 1st Baron Rothschild. ] Autograph Note Signed ('R.') to 'Mr May', i.e. Frank May, Chief Cashier of the Bank of England. 1p., 12mo. In good condition, lightly aged. Reads: 'My dear Mr May - | I am delighted you can come on Saturday. Please let me know the train you come by. Our station is Cheddington. | Yrs sincerely | R.' On May's death the New York Times reported (10 February 1897) that in 1893 he 'suddenly resigned after a mysterious meeting of the Board of Directors, and for several days exciting rumours circulated in London that something was wrong with the finances. [ Andrew Lang, as literary editor of Longman's Magazine. ] Autograph Note in the third person by Lang, rejecting a poem by Mary F. May; with the manuscript poem, titled 'Marie | (From the German of R. Gottshall [sic])'. Lang's note without date or place. May's poem from The Grange, Elstreet, Herts; 14 January 1891. Both items in good condition, lightly aged. ONE: Autograph Note by Andrew Lang. 1p., 12mo. Reads: 'With Mr Lang's Compliments, and regrets that he has no room for the translation from the German. TWO: May's translation of the poem 'Marie' by Rudolf von Gottschall' ('Marie, am Fenster sitzest du'), titled 'Marie | (From the German of R. Gottshall [sic])'. 1p., 8vo. The translation is attributed at the end to 'M.' Beneath this is written the name and address of 'Mary F. May | The Grange. Elstree. Hants. | 14th. 1p., 4to. In good condtion, lightly aged and worn, folded twice horizontally. 26 lines of text, beginning: 'The Agent General of New South Wales hereby directs the attention of Holders of the New South Wales £3 1/2 % Loan, due to be repaid 1st September, 1918, to the following terms of Conversion which are offered by the New South Wales Government, viz: -'. No other copy traced, either on OCLC WorldCat or on Copac. [Bonamy Price, political economist.] Autograph Note Signed ('B Price'). Norham Gardens, Oxford. 28 February [no year]. [Alex Younie, for Andrew Lang, Sheriff-Clerk of Selkirkshire.] Autograph Letter Signed to Melrose writers [solicitors] Erskine & Curle, explaining why Lang will have to delay payment of the dividends from 'John Brydens funds'. Title continued: "Comprising A Description of the Customs and Manners of that Country; together with Observations on its Government, Finances, Population, Agriculture, Religion, Public Schools, Conduct towards English prisoners, and Internal Commerce. To which are added, Anecdotes tending to delineate the Character of The Chief of the French Government" [presumably Napoleon]. 2 vols, pp.xii.216; viii.204, catchword on ii.204 "Useful" anticipating a 36pp. catalogue of Richard Phillips' publications missing from this copy, mauve cloth, discreetly rebacked, bumped, spine gt.title and vol. The financial diaries of a Frenchman (rentier) living in England, possibly displaced by the French Revolution. Diaries in French, covers in poor condition, contents good. Comprising: The Kentish Companion: or, useful Memorandum and Accompt Book, 1773 ; Kearsley's Gentleman and Tradesman's Pocket Ledger, 1797; and The Daily Journal; or, Gentleman's, Merchant's and Tradesman's Complete Annual Accompt Book. Address entered in first volume: Hereford Street, London. Contents: record of income and expenditure with information about investments. List of the Partners of the Banking Company in Aberdeen, Instituted 1797. Alexander Bannerman, Esq. M.P. Governor. Finely printed on one side of a piece of good wove paper, 52.5 x 41.5 cm. Very good. Around two hundred names arranged in two columns, beginning with 'Dr. John Abercrombie, First Physician to the Queen for Scotland, in Edinburgh', and ending with 'John Young, Merchant in Aberdeen - His Representatives'. Directors and Extraordinary Directors are distinguished by marks prefixed to their names. According to one authority the Bank's demise was occasioned by the 'Large advances [which] were being made to firms in which the directors of the bank also had an interest. 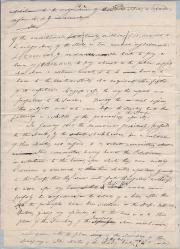 Part of Autograph Letter, with signature ('James Wilson'). 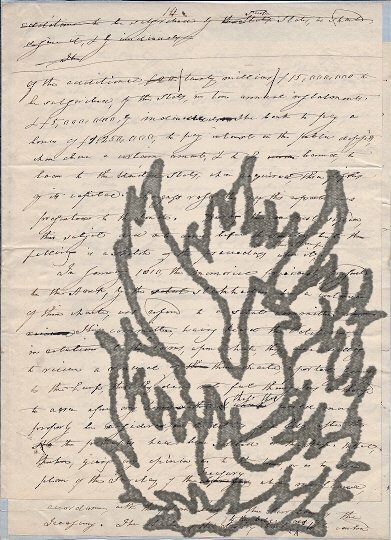 On one side of a piece of wove paper, roughly 5 x 18.5 cm, cut from letter by an autograph collector. Aged, and with staining from the glue used in mounting. Reads '<...> upon it. | I hope you are quite recovered. | Yours trly | James Wilson'. Printed Exchequer Receipt, with Manuscript Additions, and Autograph Signature, for 'the Sum of Ten Pounds being 24 Months Interest of 100£'. One page, quarto. Aged, and trimmed along one margin, with minimal loss of text. Interest on moneys 'Lent unto Their Majesties upon the Credit of an Act of Parliament, (Intituled, An Act for Granting to His Majesty An Aid of 4 Shillings in the Pound for One Year'. Witnessed, with Autograph Signature, by George Cheret. Signed 'M Orford'. Thirty-six broadsheet pages. On aged paper, with chipping to extremities and first and last leaves detached, but with text clear and entire. Articles on 'The Four New Railways', with photographs, by Sir Herbert Walker, Felix J. C. Pole, Arthur Watson and R. L. Wedgwood. Other articles include 'Electrification - The Metropolitan's Experience' by R. H. Selbie, 'Railways - Their Position and Prospects' by Sir Sam Fry, 'Railway Rates under the New Regime' by Sir W. M. Acworth and 'Finance of British Railways' by W. J. Stevens. Printed Exchequer Receipt, with Manuscript Additions, and Autograph Signature, for 'the Sum of twelve pounds ten Shillings [...] 3 Months Annuity, due at Midsumer last past, of 50 Pounds per Annum'. One page, quarto. Aged, trimmed at head and with fraying at foot. 'Received by me the Right Honble. Lewis Lord Rockingham Assignee of Thomas Wentworth'. Witnessed by and with the signatures of George Cradock and Edward Vincent. Signed 'Rockingham'. French financier (1758-1850). Offical letter, two pages, folio, text in secretarial hand, signed by Mollien, some defects but mainly good condition. "Monsieur le Courte, je prie Votre Exc ellence de vouloir bien presente le plus promptement possible a Sa Majeste, le Budget Speculatif de recetter et de depenser de la caisse des Invalides pendant l'annee 18 . / Ce budget doit etre le premier element de la Comptabilite du Tresorier que Sa Majeste a etablie pour ce Service par Son Decret du 13. Aout dernier. / Le premier Article de ce budget me parois dernier presenter a [lu recette?] ce qui .